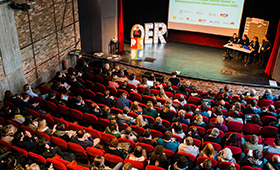 The OER festival, from 27 to 29 November 2017 in Berlin, can be seen as the culmination to a very active and successful year in all aspects relating to Open Educational Resources in German-speaking countries. Its purpose was to promote exchange within the community and to further enhance the visibility of the OER community. The OER festival involved several activities. Participants in projects supported by the BMBF funding line OERinfo came together again at the final OER Camp this year to share their findings to date with the community and to engage in discussion. The Federal Institute for Vocational Education and Training was also involved again as a transfer partner for OER in vocational education and training as part of the central information centre coordinated by the German Institute for International Educational Research. The BIBB ran a workshop on the potential for and challenges of OER in vocational education and training. Together with Wikimedia, the German Chambers of Industry and Commerce also offered a workshop on the theme of “OER and company-based continuing education and training - a review”. In the barcamp sessions, additional initiatives and projects were presented and invited discussion among participants. The best open educational resources in German-speaking countries were also selected again this year for the OER Award. The total of 89 submissions were received in 9 categories differentiated by training sector and special categories - more than twice as many as in the previous year. There were six submissions for the category “Training and education/VET”. In an intensive evaluation process, three of these were selected for the prize-giving by the jury. This year's prize winner in this category was TEAM@WORK: Tips for working in companies with refugees, created in cooperation with Bildung & Begabung [Training & Talent] and Evonik AG. The offer uses multi-media responses to the ten key practical questions when working with young refugees in companies in order to provide valuable information and tips for practice. The resource was designed together with trainers and trainees from a migration background and with experts working in the field of intercultural support. The aim of the OER specialist forum was to present the extensive OER landscape in German-speaking countries and to promote discussion within this context. Two key target groups were invited for this purpose: the OER practitioners from organisations, initiatives and projects and OER disseminators - decision makers in authorities and ministries, with responsibility for initial and advanced training, in associations and charities and in training institutions in all sectors. The focus here was in the Ljubljana OER Action Plan 2017 and its importance for Germany. In addition to this, the issue of sustainable activities to support the ongoing funding of OER in the German education training system was addressed in working groups. This included, for example, the funding of necessary IT infrastructures, additional qualification concepts and concepts for building awareness as well as further research questions relating to OER. The second edition of the OER atlas was published in time for the OER festival. This provides an up-to-date overview of the German-speaking OER landscape. Both the database as well as the publication can be reused licence free. The OER world map relies on entries from the OER community. Please continue to update the entries on your own offers as well as create new offers.